To say that we here at Between The Covers have a few boxes of uncataloged items is a bit of an understatement. While there’s a lot of work ahead, it’s fun going through those boxes to see what you find. The other day I turned up a cool item from the collection of Edwin Erbe, former publicity director for New Directions. 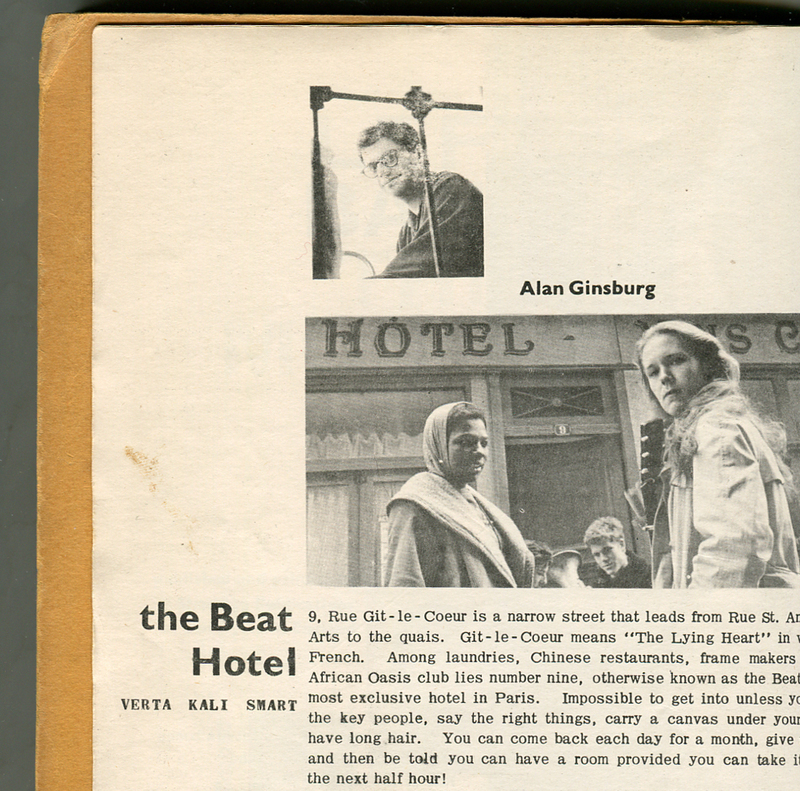 It’s a copy of Left Bank This Month magazine with the cover story, “Inside the Beat Hotel” by Verta Kali Smart published in the late ’50s. If you’ve never heard of it, don’t be surprise because it seems that no one else has either. Information about Left Bank is scarce. What we’ve been able to determine comes mostly from the magazine itself. There is virtually no mention of it in Beat literature or anywhere online, except for the location of one other copy in The Netherlands. The cover claims that this issue is volume 2, number 1, but we suspect this is the only issue ever published. 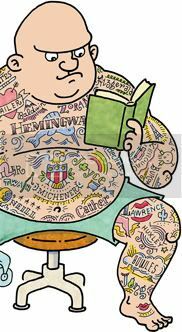 It was printed in London and distributed to tourists in the Latin Quarter in Paris in 1958 or 1959. The editor is Ronald Sheridan but we believe it was produce in large part by Smart, herself a resident of the Beat Hotel, who wrote several of its articles, along with contributions from Gregory Corso, Thomas Tindall, Piero Heliczer, and several others. A peak inside this hard-to-find item. That's writer Verta Kali Smart wearing the head scarf. Harold Chapman's 1984 book that collected his photos, many first published in Left Bank This Month. And if the nickname wasn’t enough to make the magazine interesting, it’s illustrated with over a dozens photographs by the hotel’s resident photographer, Harold Chapman, also likely their first appearance in print. The photos here as well as many more were later collected in his 1984 book, The Beat Hotel. One picture from the book that’s not in the magazine is of Smart at her typewriter with the following caption: “January 1958. Verta Kali Smith, working on her article, ‘Inside the Beat Hotel,’ for the ‘Left Bank This Month,’ which was sold to tourists at 300 francs a copy, in the streets of the Latin Quarter.” It’s one of the only references we can find to the magazine and likely the source of the wikipedia information giving Smart credit. So there you have it. That’s pretty much all we know at this time. If anyone can shed some light on this mysterious and little-seen item of Beat history, let us know. i could probably put you in touch with harold chapman whose close friend ron sheridan was at the time of publication and harold could tell you more of the history. meantime would you care to quote me a price for your copy of left bank this month? what sort of condition is your copy in please? January 1960, having myself lived in the “Hotel” on and off during 1959. I cannot send it to you now because it is in my farm house in Maine and I have just returned to my home in Honolulu for the winter. I am working on a documentary about Verta Kali Smart Grosvenor and very interested in her early years in Paris. I saw your note back in October 2011 that you may have a copy of “Left Bank This Month” at your home in Maine. Wondering if you were ever able to locate in during the years since. Even if you are not interested in parting with the original copy, I would be interested in procuring a copy of the journal. I look forward to hearing from you and any assistance or information you might be able to provide is much appreciated. We are working with Verta (who now goes by Vertamae Smart Grosvenor) and her daughter Kali on the project. i wonder if someone who has a copy of this mag wouldn’t mind transcribing the article mentioned ‘inside the beat hotel’ – or send me some images and i’ll happily transcribe it for the benefit of the world. I visited the beat hotel in a dream once, unfortunately my recollections don’t transcribe readily into reality. On the first indie mag run by a couple of beatniks in paris. Verta Kali Smart was about 19 or 20 at the time she wrote that article. She is now known as Vertamae Smart Grosvenor, a renowned culinary anthropologist, cultural griot, author, NPR commentator and actress. Hope this is useful. Thank you for the information. Very helpful indeed. And what an interesting woman! How did the documentary go? I forgot to locate my copy of Beat Hotel in Maine, and now I am back in Honolulu. Sorry.